Each Invoice Record will have individual invoice line items (the details which the customer sees). There are two different types of line items that can be added: Time and Expense. The actual time and expense entries entered are associated with each line items. This is all done via the Invoice Record details form. See Invoice Records for more details. 1. Click the invoice record name in the invoice record list (see Invoice Records - Adding/Editing, in Invoice Records - Add-Edit Form). 2. The Invoice Record details form is displayed. The top of the form displays most of the invoice header information (the information that was entered when the invoice was created). In addition, it displays the unique internal ID assigned to the project (project number). This information is displayed here so it is easily visible to see what invoice is being worked on. The section below that displays the invoice line items and other details. It will be blank to start with just the headers showing and no information below that (unless you created the invoice record from a template that had pre-defined invoice line items. In that case the invoice line items are displayed). There is a separate function to add time and separate function for adding expenses, but the process for adding both is the same. Time and Expense line items can be created automatically by Project Insight with the individual time and expense entries automatically attached as well. Invoice line items can be created manually or Project Insight can do it automatically. Doing it automatically, will create the invoice line item using the details from the time and expense entries. Doing it manually, the invoice line item data has to be entered but time and expense entries can still be batch selected and attached. There are two different standard types of line items that can be added: Time and Expenses. Time and Expense line items can be added manually and then the individual time and expense entries can be batch selected and manually attached. Time and Expense line items can be created automatically using the details from the individual time and expense entries and then the individual time and expense entries are alo automatically attached. 1. To add a time line item manually or automatically, hover on the Add Time Line Item menu option. Sub-menus will appear. a. Click on Add Time Line Item to manually add a time line item. b. The Invoice Time Entry Line Item - Add form appears, see Invoice Time/Expense Entry Line Items - Add/Edit for next steps. a. Click on Automatically Add Time Entry Invoice Line Item to automatically add a time line item. b. The Automatic Time Entry Invoice Line Item Creation layer appears. This is where parameters are set as to how the line items are automatically generated. c. Dates - Enter the Date Ranges of the time entries that are to be included on the invoice. The date range criteria will be applied to the date of the time entry. d. Line Item Group By Option - Select how the line items are going to be generated. 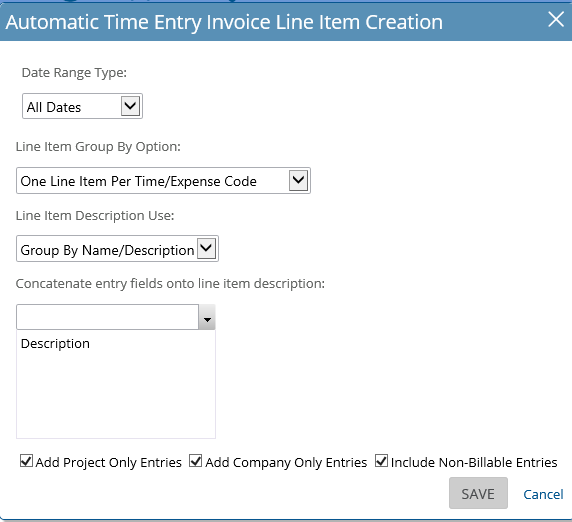 Time entries can be grouped together and one invoice line item generated for each group. For example, you could group all the time entries by task and create one invoice line item per task. Alternatively, one invoice line item could be created for each individual time entry. This would be used if a client needed to see a detailed breakdown of every time entry made by the resources. Click in the drop down and select an option. One Line Item Per Entry - every individual time entry will generate one line item on the invoice (Note* the invoice line item will look very similar to the time entry that's attached to it but they are still separate data elements on the invoice and the client only sees the invoice line item). One Line Item Per Task - individual time entries will be grouped by the task they are associated with and an invoice line item will be created with the task name as the item description. If there are multiple tasks with time entries, then an invoice line item will be created for each task. One Line Item Per Resource - individual time entries will be grouped by the resource and an invoice line item will be created with the resource name as the item description. If there are multiple resources with time entries, then an invoice line item will be created for each resource. One Line Item Per Resource Type - individual time entries will be grouped by the resource type and an invoice line item will be created with the resource type as the item description. If there are multiple resources types with time entries, then an invoice line item will be created for each resource type. One Line Item Per Summary Task - individual time entries will be grouped by summary tasks and an invoice line item will be created with the summary task name as the item description. When this option is chosen, there is an additional field displayed called At Depth. Leaving the At Depth level blank, indicates that invoice line items will be created for every summary task no matter how many levels deep (provided they have a time entry associated with them or their non-summary child tasks). If a number is entered such as "2" then invoice line items will only be created for Summary tasks up to 2 levels deep, such as Summary Task 1 and Summary Task 1.1. Any time entries at Summary Task 1.1.1 will be rolled up into the line item for Summary Task 1.1. Enter the number of levels deep as required or leave it blank. One Line Item Per Top Level Summary Task - individual time entries will be grouped by only the top level summary task (or Summary Task 1 in the above example) and an invoice line item will be created with the summary task name as the item description. One Line Item Per Time/Expense Code - individual time entries will be grouped by the time code and an invoice line item will be created with the time code name as the item description. f. Concatenate entry fields onto line item description: - The line item description is populated as described above, but there are also options to concatenate additional information onto that. For example, if one line item per task was chosen, the task name is the first part of the line item description and then each resource that worked on the task could also be automatically added to the description. These options don't change regardless of the selections above, so in some cases the combinations could be redundant. If One Line Item Per Resource was chosen, the resource name is already set as the line item description so choosing the Resource again here would be redundant. If there is multiples, then each are listed separated by a comma, so it is possible the description could become very long. g. Add Project Only Entries - Depending on how the system is configured, time entries may be entered at a project level (and not associated with a task). If that's the case, checking this option will include those entries (if they also meet the other criteria entered). h. Add Company Only Entries - Depending on how the system is configured, time entries may be entered at a company level (and not associated with a project or a task). If that's the case, checking this option will include those entries (if they also meet the other criteria entered). i. Include Non-Billable Entries - Time Entries can be designated as billable or non-billable. To include those marked non-billable, check this option (billable time entries are automatically included). If this option is checked, non-billable time entries will attached to the invoice line item so the actual hours can be measured against the invoiced hours, but the hours or value of non-billable entries won't be included in any line item hours, rates and totals calculations. The invoice line items will be automatically generated with the associated time entries attached. 1. To add a time line item manually or automatically, hover on the Add Expense Line Item menu option. Sub-menus will appear. a. Click on Add Expense Line Item to manually add a time line item. b. The Invoice Expense Entry Line Item - Add form appears, see Invoice Time/Expense Entry Line Items - Add/Edit for next steps. a. Click on Automatically Add Expense Entry Invoice Line Item to automatically add a time line item. b. The Automatic Expense Entry Invoice Line Item Creation layer appears. This is where parameters are set as to how the line items are automatically generated. c. Dates - Enter the Date Ranges of the time entries that are to be included on the invoice. The date range criteria will be applied to the date of the expense entry. d. Line Item Group By Option - Select how the line items are going to be generated. Expense entries can be grouped together and one invoice line item generated for each group. For example, you could group all the expense entries by task and create one invoice line item per task. Alternatively, one invoice line item could be created for each individual expense entry. This would be used if a client needed to see a detailed breakdown of every expense incurred. Click in the drop down and select an option. 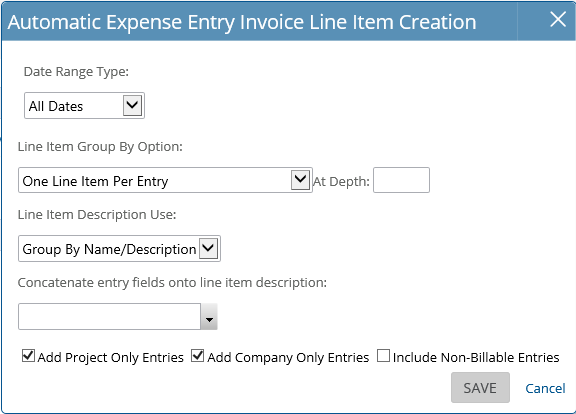 One Line Item Per Entry - every individual expense entry will generate one line item on the invoice (Note* the invoice line item will look very similar to the expense entry that's attached to it but they are still separate data elements on the invoice and the client only sees the invoice line item). One Line Item Per Task - individual expense entries will be grouped by the task they are associated with and an invoice line item will be created with the task name as the item description. If there are multiple tasks with expense entries, then an invoice line item will be created for each task. One Line Item Per Resource - individual expense entries will be grouped by the resource and an invoice line item will be created with the resource name as the item description. If there are multiple resources with expense entries, then an invoice line item will be created for each resource. One Line Item Per Resource Type - individual expense entries will be grouped by the resource type and an invoice line item will be created with the resource type as the item description. If there are multiple resources types with expense entries, then an invoice line item will be created for each resource type. One Line Item Per Summary Task - individual expense entries will be grouped by summary tasks and an invoice line item will be created with the summary task name as the item description. When this option is chosen, there is an additional field displayed called At Depth. Leaving the At Depth level blank, indicates that invoice line items will be created for every summary task no matter how many levels deep (provided they have a time entry associated with them or their non-summary child tasks). If a number is entered such as "2" then invoice line items will only be created for Summary tasks up to 2 levels deep, such as Summary Task 1 and Summary Task 1.1. Any expense entries at Summary Task 1.1.1 will be rolled up into the line item for Summary Task 1.1. Enter the number of levels deep as required or leave it blank. One Line Item Per Top Level Summary Task - individual expense entries will be grouped by only the top level summary task (or Summary Task 1 in the above example) and an invoice line item will be created with the summary task name as the item description. One Line Item Per Time/Expense Code - individual expense entries will be grouped by the time code and an invoice line item will be created with the time code name as the item description. g. Add Project Only Entries - Depending on how the system is configured, expense entries may be entered at a project level (and not associated with a task). If that's the case, checking this option will include those entries (if they also meet the other criteria entered). h. Add Company Only Entries - Depending on how the system is configured, expense entries may be entered at a company level (and not associated with a project or a task). If that's the case, checking this option will include those entries (if they also meet the other criteria entered). i. Include Non-Billable Entries - Expense Entries can be designated as billable or non-billable. To include those marked non-billable, check this option (billable time entries are automatically included).